Domestic yak are bovid animals in the family Bovidae. Yak belong to the genus Bos and species grunniens. They differ from the vulnerable population of wild yak, Bos mutus which currently exist in a small region above 14,000 feet in the Tibetan Plateau. Comparatively, common domestic cattle are classified as Bos taurus. Yak are also known as the “Grunting Ox” due to the low grunting sounds they make when communicating or excited. They are otherwise silent. Yak are characterized by their large horns, shoulder hump, horse-like tail and full coat of dense fiber. Bulls with ample fiber have a “skirt" that sways as they walk. Females typically weigh between 600-900 pounds and bulls can weigh up to 1700 pounds. Their size is determined by both genetics and quality/quantity of feed. Yak have a layered coat with cashmere-like down underneath and long thicker guard hairs over the entire body. There are multiple phenotypes of yak and they can vary in appearance. Some have longer, more “horse-like” faces and little to no hair on the forehead. Others have shorter, boxy shaped heads. Some have an immense amount of hair. These long haired animals are called hairy forehead yak in Tibet, and super woolies in the US. breeders may have different preferences, but there are general conformation, size, and temperament standards that determine an animal’s value. Yak Produce both an outer and inner fiber; yak fiber has multiple uses and is highly prized. There are three types of yak fiber. The outer fiber (79-90 microns) has historical and contemporary uses in the Tibetan Plateau for making strong tents. The mid length fiber (20-50 microns) is used to make outerwear, ropes, rugs, and blankets. The final inner layer is down (16-20 microns). Similar to cashmere, it has an increasing following in the fashion industry, being recognized for its softness, warmth, and luxury appeal. It is warmer than merino wool and does not contain lanolin like sheep's wool. 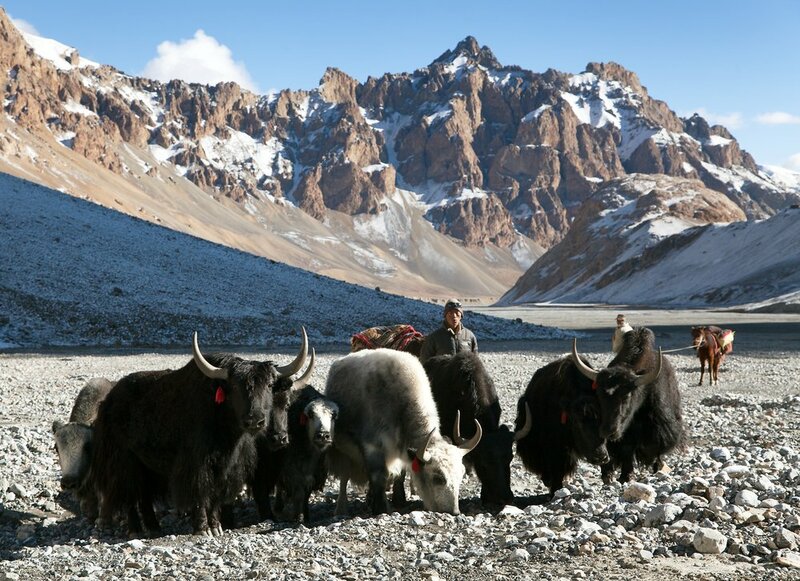 Yak are still used in remote areas for packing, riding, milk, meat, shelter, clothing, tools, and accessories. Yak dairy products are a major form of sustenance for people in the Tibetan/Himalayan region. Their fiber is used to make tents, outerwear, ropes, clothing, and bags. Meat and dairy are often dried for preservation. With the rise of globalization and the increase of young people moving to urban areas, traditional lifestyles with yaks are on the decline. However, yak fiber is becoming internationally popular and increased demand may help promote the lifestyle of traditional nomadic peoples. It has been generally thought that domestic yak evolved through breeding wild yak with Asiatic cattle breeds. This, however, is untrue. While it is common to breed yak with cattle to create hybrids, the species was most likely developed through humans domesticating wild yak millenia ago. The offspring of yak and cattle crosses in Tibet are called “dzo” for males and “dzomo” for females. 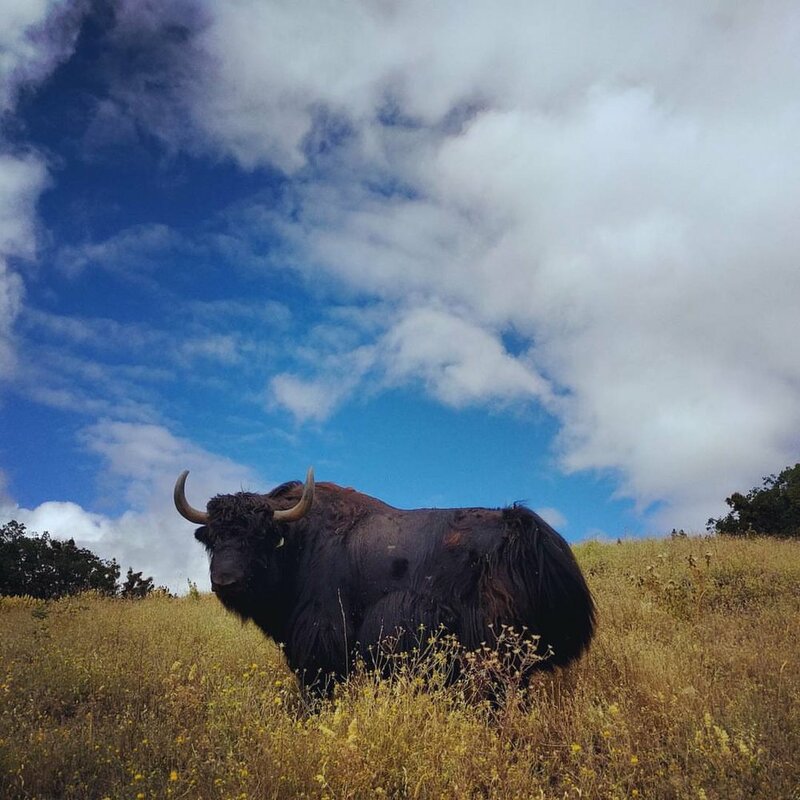 These animals serve a very specific purpose in their native regions, but hybrids are not reintroduced into the yak population for breeding purposes. Yak make great farm pets and packing animals. 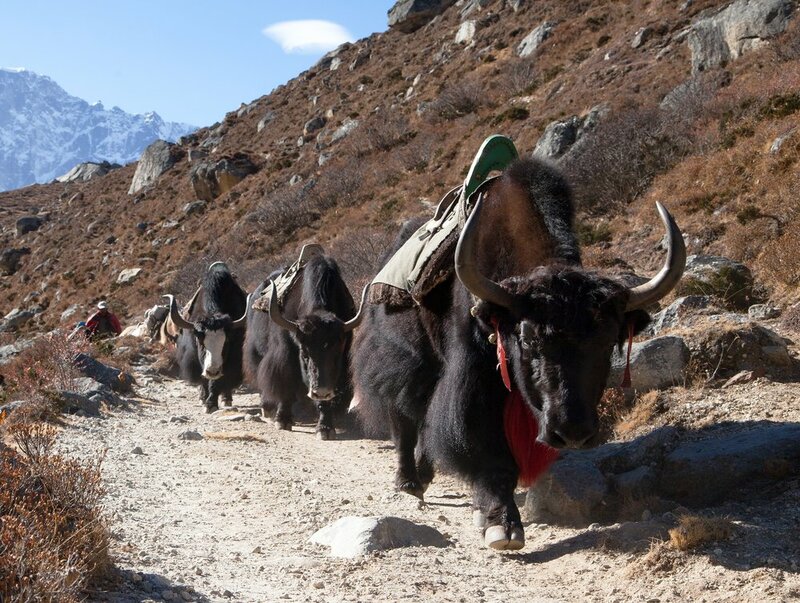 With halter and packing training, yak can traverse rugged wilderness terrain with either a rider or supplies. On the farm, yak are happiest when they have their own pasture apart from other animal species, unless given adequate space to do their own thing. We recommend having at least two yak, as they are herd animals and enjoy each other's company. Yak arrived in the United States via Canada in the early 1900's. The entire population began with around 20 yak. Currently there is no importation of live animals or fluids into the United States. Therefore, proper breeding programs are of key importance to maintain genetic diversity. Many breeders practice line breeding to ensure integrity of the genetic base. Yak began to gain popularity in the 1980’s when ranchers increasingly began breeding programs. The population in the North America is currently estimated to be around 7,000 animals. The popularity of yak meat is on the rise, as is the demand for yak fiber. Each year new breeders begin herds on farms and ranches across the US and Canada. However, yak are less tolerant of heat and humidity and perform best in regions with seasonality. Here is a well researched article on how yak arrived in the US. There are three color patterns in the US, Royal, solid and trim. Royal is a black and white piebald pattern. Solids are either Native Black, with a grey nose and black to brown coat or Imperial, with a black nose and generally darker black coat. Trims are either Native black or Imperial, with a white star or stripe on the head, and potentially white on the tail and feet. More on color inheritance. Yak are beautiful, funny, and intelligent animals, producing multiple products of value. With their nutrient-rich milk and meat, luxurious fiber, intellect, playfulness and sweet demeanor, they are a joy to raise. Their smaller size, efficient grazing and digestion makes yak lighter on the land than other bovine species such as cattle and bison. These combined qualities make yak an ideal animal for small to mid sized farms and ranches. 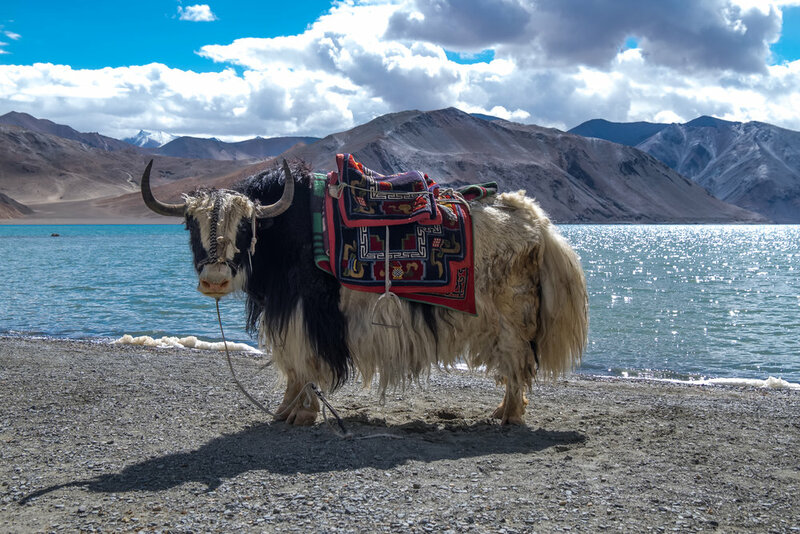 Originating in the Tibetan Plateau, yak are fully equipped to brave through adverse weather conditions. They calve easily and are very protective of their young, eliminating predatory threat with their fierce horns. Best of all, they can have social, entertaining, and endearing personalities that earn them an esteemed place on the farm. They are often seen running, leaping, and kicking their hind legs in the air while swishing their full tails. Yak are generally very hardy and not susceptible to diseases. They are easy keepers and do not test fences, as long as they are happy where they are. They require a salt and mineral block in addition to pasture and supplemental hay in winter. Their hooves require regular trimming, and their coats are generally brushed seasonally in the spring as they shed their winter down. Super wooly animals may require shearing for the first couple of years or more, as the coat tends to felt. In the Himalayas, yak may reproduce every other year due to the harsh climate and lack of sufficient nutrition to calve consistently. In the US, yak calve annually with a 9 month gestation period and 28-day heat cycles. Typically calves are weaned around six months. In their native region they provide transportation and packing, fiber, milk and meat. They are fully equipped to deal with adverse weather using their compact size and full coats of inner and outer fibers which grow and shed seasonally. Yak are intelligent, alert and calm, with excellent eyesight and hearing. Their only natural predator is the Tibetan Wolf. They have less impact on the land than cattle with smaller feet and more efficient nutrient absorption, eating about one-third of a cow’s daily consumption. Their manure makes excellent fertilizer for crops. Even though yak can survive on the sparse Tibetan Plateau, we like to keep them happy on organic alfalfa and mountain pastures. A good feeding program makes for beautiful, healthy animals. More on yak meat here. Yak milk has a higher nutrient density and butterfat than domestic cow milk, and has sustained life in the Himalayas for thousands of years. Typically Tibetan yak herders milk half and save the rest for the calf. We look forward to producing milk, yogurt, and cheeses as we build our milk herd. The International Yak Association is an organization founded in 1997 and offers registration of animals to keep track of genetics. The organization offers a wealth of information, partnering with scientists to increase genetic information and testing, nutritional needs and values for meat, fiber quality criteria, etc. Many breeders show yak at the National Western Stock Show in Denver, CO each year, competing animals in conformation, fiber, showmanship and halter classes.